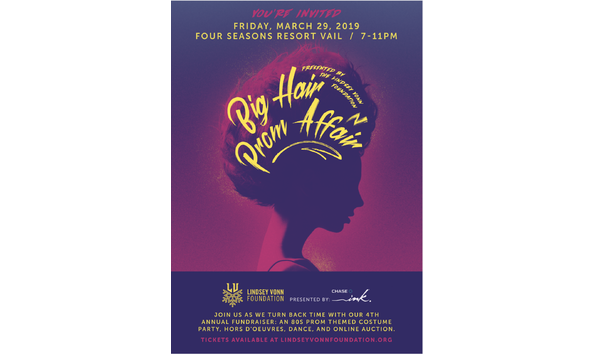 Get your hairspray and turn back time at The Lindsey Vonn Foundation's 3rd annual costume themed party: Big Hair Prom Affair. Join us for a silent and live auction, Hors d'oeuvres, dancing to the Jordan Kahn Orchestra band, After Party and more! Auction items include works of art, exclusive getaways, and one-of-a-kind keepsakes. Our biggest party yet in support of The Lindsey Vonn Foundation's mission to instill confidence and grit in the next generation! Tickets to the LVF 3rd annual costume themed party of the year! Live and silent auction, great music, food, dancing, and much more. Join us! Event tickets, VIP Corsage, and After Party Tickets for up to 5 guests. After Party with food and DJ until midnight. Event tickets, VIP Corsage, and After Party Tickets for up to 10 guests. After Party with food and DJ until midnight. Description: Providing scholarships and programming for education, sports, and enrichment programs to give future generations the tools they need to reach their goals and discover their grit within.